The Republican presidential candidates take the stage for the first prime-time presidential debate hosted by Fox News on Aug. 6, 2015, in Cleveland. 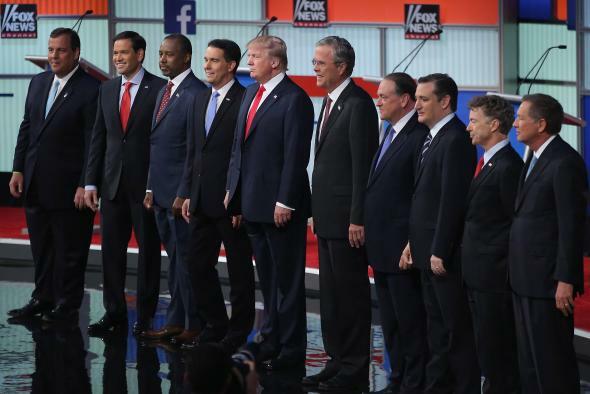 The first debate on Fox News clocked in at a little less than two hours. The CNN debate Wednesday will run nearly an hour longer—somewhere in the neighborhood of 2 hours, 45 minutes. … The duration of the debate is no joke to the candidates: on Tuesday evening, CNN clarified its restroom policy to the campaigns. One bathroom break is permitted during the third commercial break, which lasts four minutes and 30 seconds. To state the obvious: Three hours is an eternity in a world where most political conversations are reduced to thirty-second sound bites and where stump speeches often don’t cross the half-hour mark. The extra time could bore viewers (and frustrate those of us in the press working on deadline tonight)—but it also introduces an interesting variable that might force candidates outside of their comfort zones. It’ll be easy to stick to the script early in the debate, but avoiding a slip-up, unplanned outburst, or some other made-for-YouTube gaffe will get significantly more difficult in hour No. 3 under the bright lights. If you’re watching at home, make sure to stock up on food and booze. If you’re Marco Rubio, you might want to invest in a CamelBak.